Graduated nurse focuses all their efforts to care for seriously ill newborns and their needs in neonatal intensive care unit (NICU). Complications in the newborn's clinical progression are frequent and they need not only technical skills, specific, and updated knowledge, but also agility and sensitivity, causing excessive physical and emotional stress in these professionals. In Iraq, the high percentage of neonatal deaths could be clarified by the deterioration of the health services and the socioeconomic conditions during the last decades, chiefly that of women and children. All these factors had a harmful effect on delivery and neonatal services. Publishing on the role of graduated nurse in NICU is scarce. This was the impetus to carry out this study. This study was done to determine the effect of graduated nurse on neonatal mortality in Iraq. Two hospitals were chosen from Baghdad, Iraq. From hospitals in Al-Rusafa, Children's Welfare Teaching hospital in Medical City was chosen. Al-Kadhimiya Children Hospital was chosen from hospitals in Al-Karkh, Baghdad, Iraq. Data were got from records in the department of statistics in both chosen hospital. Data were about neonatal admissions, neonatal death in NICU, number of graduate nurses, and number of total nurses. The requested data were for 2012–2016. The data gathering was carried out for October 1, 2017–December 30, 2017. Neonatal mortality proportions (NMP) out of admission were calculated. Graduate nurse proportion out of total nurse was calculated. The trend of neonatal mortality proportion and numbers of graduate nurse proportion with years were represented by regression lines. P < 0.05 was considered to be statistically significant. NMPs were 0.06 in 2012 and 0.08 in 2016. The increased in NMP were 0.02 during the study. The graduated nurse proportion was 0.09 in 2012 and 0.11 in 2016. 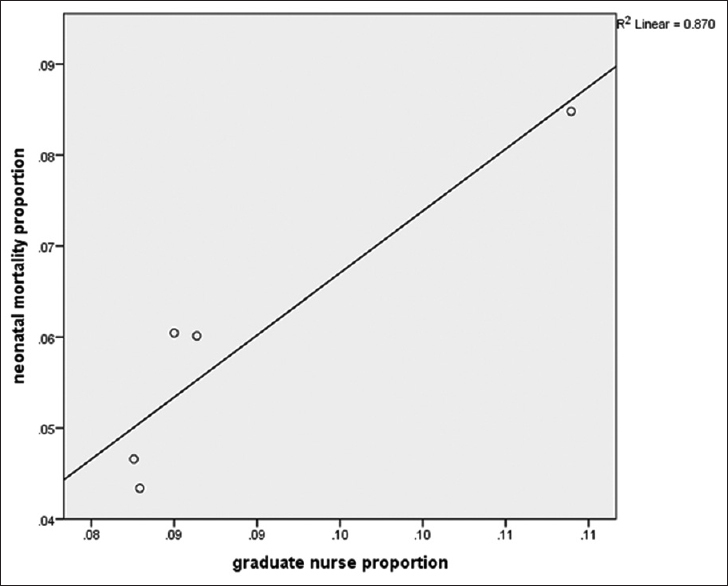 The increased in graduated nurse proportion were 0.02 during the study. The NMP was increasing as the graduated nurse increasing. The association was significant (P = 0.02) (R2 = 0.870) [Figure 1]. The graduated nurse proportion was increased by 0.02 from 2012 to 2016. Surprisingly, the increase in number of graduated nurse proportion was associated with increase in NMP significantly (P = 0.02). This finding might be explained by the fact that inhomogeneous nurse team in NICU. Teamwork might be disturbed by this in homogeneousity. No clear separation in job description according to the level of education of nurse (graduated, technical, skilled, and nurse). This administrative defect might be another explanation for the finding high NMP. Literature showed that the impact of clear job description on the performance of nurse. Working in NICU requires special skills for nurse in performing neonatal care, for example, I. V. fluid, oxygen, monitoring of vital function and function of incubator, dealing with APGAR score, feeding, and being patient. Another explanation, the finding might be the curriculum of graduated nurse becomes more essential since nursing services and nursing education do not support fundamental needs in job conditions. Experience from other countries showed that assigned jobs from graduate nurse in untrained issues. Being graduated might enhance rapid training which was not the case in Iraq. This study can conclude that graduated nurses have no role in the reduction of neonatal mortality. Klock P, Erdmann AL. Caring for newborns in a NICU: Dealing with the fragility of living/surviving in the light of complexity. Rev Esc Enferm USP 2012;46:45-51. Awqati NA, Ali MM, Al-Ward NJ, Majeed FA, Salman K, Al-Alak M, et al. Causes and differentials of childhood mortality in Iraq. BMC Pediatr 2009;9:40. Profit J, Sharek PJ, Kan P, Rigdon J, Desai M, Nisbet CC, et al. Teamwork in the NICU setting and its association with health care-associated infections in very low-birth-weight infants. Am J Perinatol 2017;34:1032-40. Top M. Organizational variables on nurses' job performance in Turkey: Nursing assessments. Iran J Public Health 2013;42:261-71. Cheraghi M, Salsali M. To understand the process of theory and practice gap in nursing education in Iran. Iran J Public Health 2005;34:26-7. Khoshrang H, Salari A, Dadgaran I, Moaddab F, Rouh-Balasii L, Pourkazemi I. Quality of education provided at the clinical skills lab from medical students' viewpoints in Guilan University of medical sciences. Res Med Educ 2016;8:77-83.